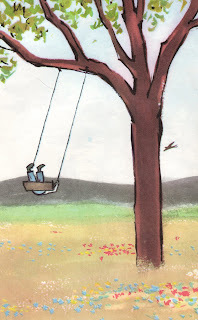 Author of one of my faves, The Moon Jumpers, Ms. Udry created a read that is so totally innocent and sweet it makes you ache for a world here the wonder of trees is an everyday contemplation. I love the simple pen and ink strokes of the pictures and the way all the children depicted look so sure of themselves and the world in which they live. Cats get away from dogs by going up the tree. Birds build nests in trees and live there. Sticks come off the trees too. We draw in the sand with sticks. I love the second to the last line there, because these sorts of things are what stick in your child's imagination for a lifetime. Since reading Keats' The Snowy Day, my son is constantly smacking on trees with sticks and this book kind of brings it full circle. Just those sorts of things we lose as an adult. That sticks do come from trees and how cool it is that they are lying around everywhere, waiting for us to pick them up and write in the sand.